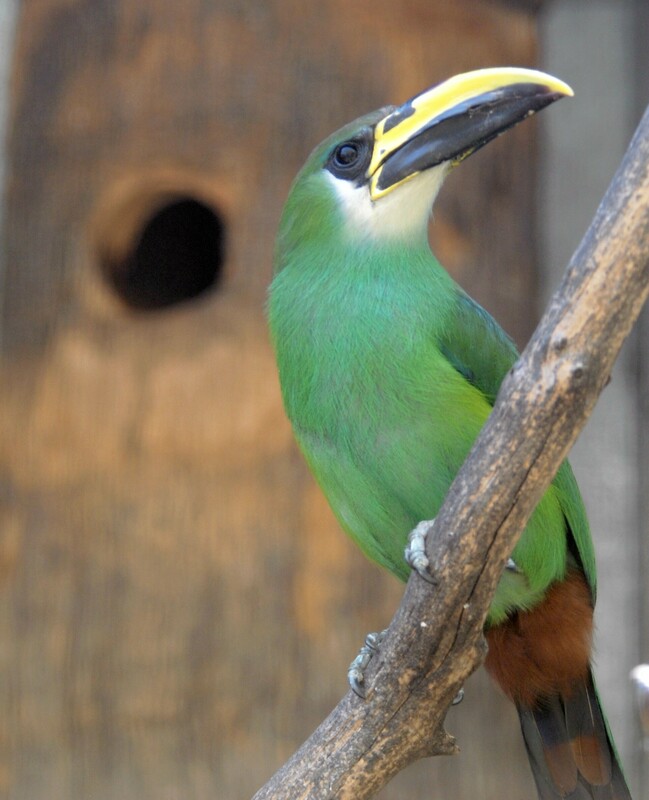 Toucans and their smaller relatives, the toucanets and aracaris are all species within the family Ramphastidae, which is in turn part of the Order Piciformes. 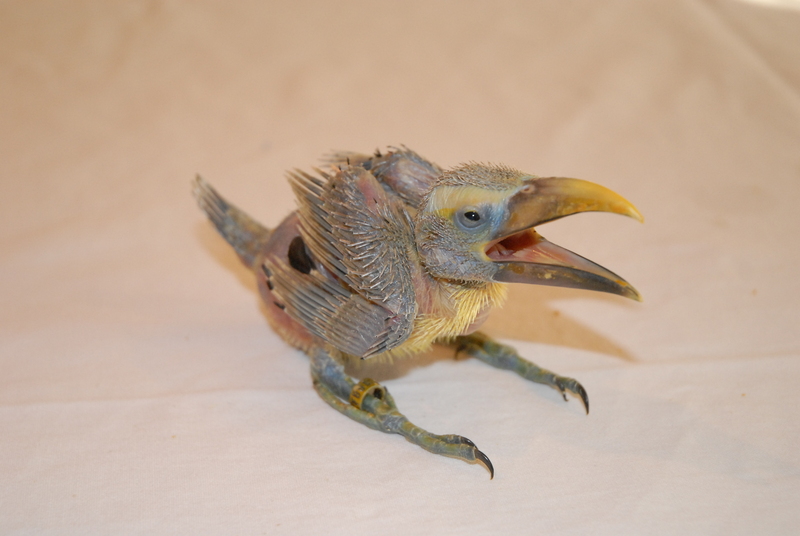 The Order Piciformes also includes the families of woodpeckers, barbets, honeyguides, jacamars, and puffbirds. Of these families the toucans, jacamars and puffbirds are found exclusively in the neotropics. The family Ramphastidae consists of six genera and forty two species, of which approximately twenty one species are found in captivity in the U.S., however seven of these species are so rare as to be found only in a couple of collections. The most eye-catching characteristic of the large toucans is their disproportionately large, colorful beak. Combined with their clownish behavior, these birds have attracted lots of attention since the time the Spanish Conquistadors first spied them in the rainforests of the lands they conquered in the fifteenth century. Today, toucans are the quintessential symbols of the "tropical paradise" many of us long to visit. Our fascination with toucans runs the gamut from breakfast cereal logos to refrigerator magnets, yet we see very few in zoos and private collections. And, what few species of toucans there are in our avicultural enclaves now, are doubtful to remain there long into the future. 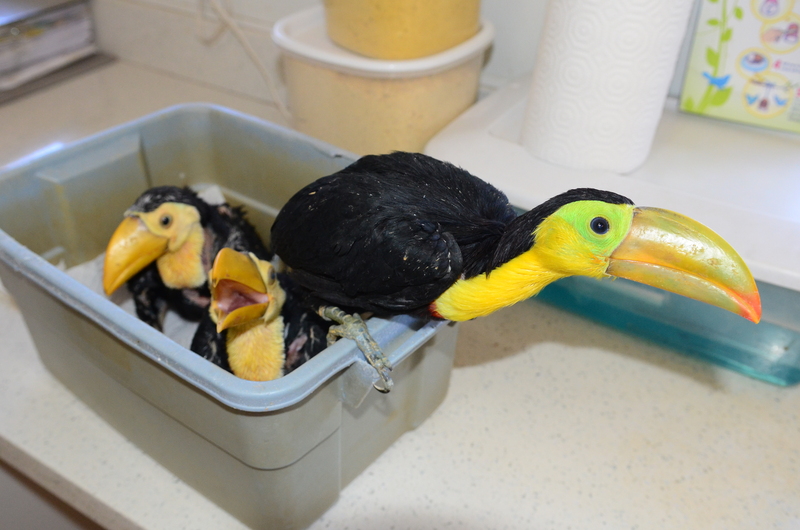 Maintaining and breeding toucans in captivity is neither difficult nor tedious and requires no more work than required of parrot breeding, and in some ways less. There are several areas that require particular attention to detail, which include housing, compatibility of pairs, diet, and care of offspring. Toucans are territorial birds during breeding season and are very active fliers. It appears, therefore, that the larger the flight, the better they are likely to breed. 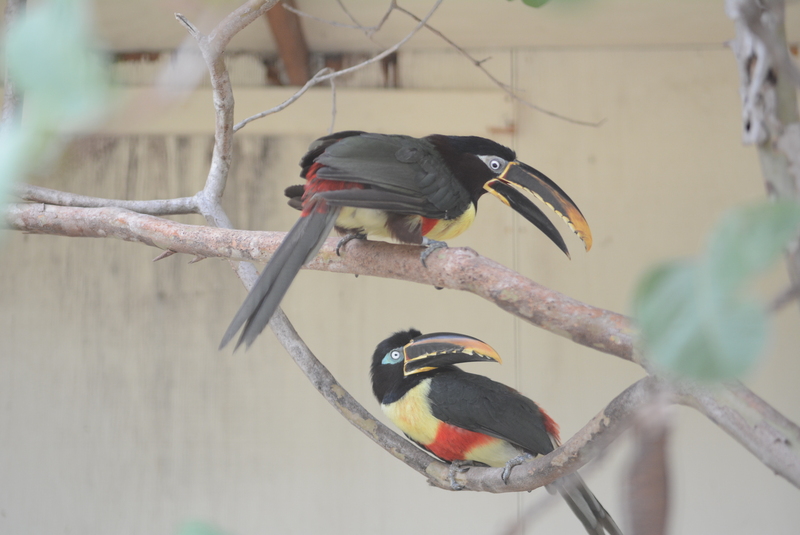 Currently, at Emerald Forest Bird Gardens, we use flights measuring 12 feet wide by 24 feet long by 9 feet high for the large toucans, and 8 feet wide by 12 feet long by 9 feet high for the toucanets and aracaris. 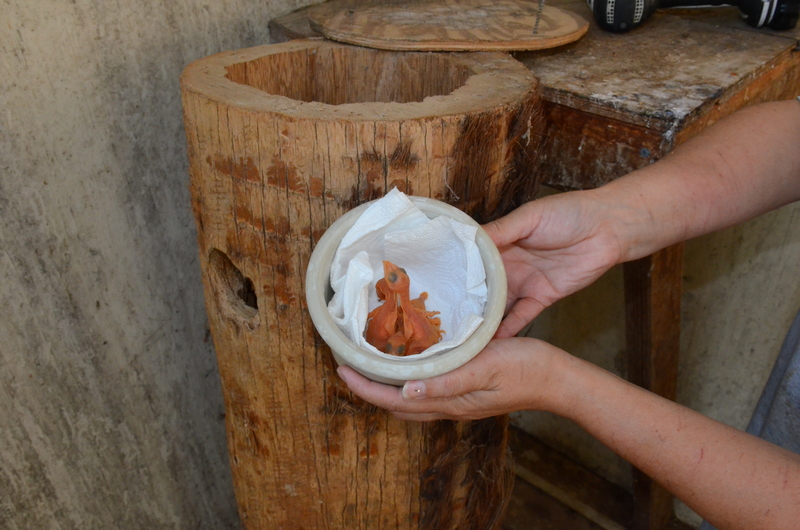 We have had excellent success of 80% egg production with the smaller birds in the smaller flights, whereas the success rate of the large toucans has been only 33 %. In comparison, the Riverbanks Zoo has achieved 100% with the large toucans, which they house in flights 10 feet wide by 30 feet long. It is clear from years of experience that toucans are more likely to breed if they cannot see their neighbors. To prevent visual contact, we have used a combination of 90% shade cloth overlapping reed fencing. This barrier, however, allows some light and the toucans can see their neighbor's movement if the sun is behind the neighbor. 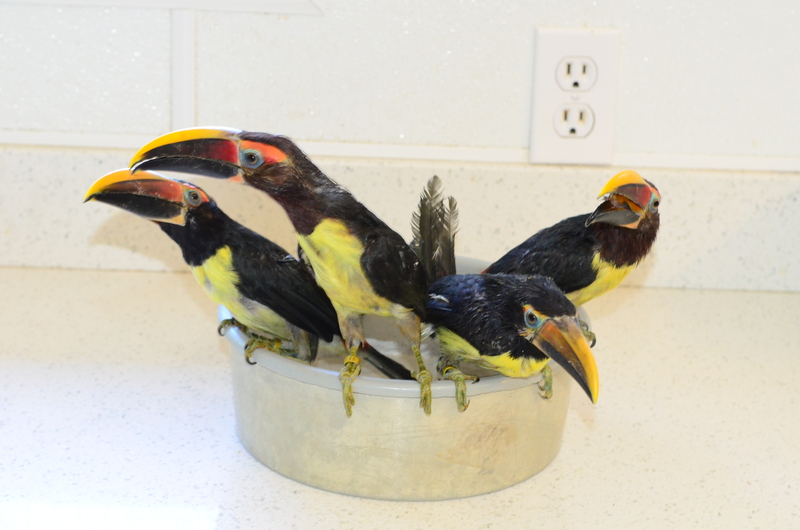 Also, the toucans will attempt to peck a window through the shade cloth, which they have done successfully on numerous occasions requiring continuous repairs. Riverbanks Zoo, on the other hand, has used concrete blocks, which we have followed at our Peruvian toucan breeding facility. Audio contact still exists at both Emerald Forest Bird Gardens and Riverbanks Zoo suggesting that it is not as important as visual contact. In the rainforest, toucan calls carry some distance, while the forest denseness prevents visual contact. 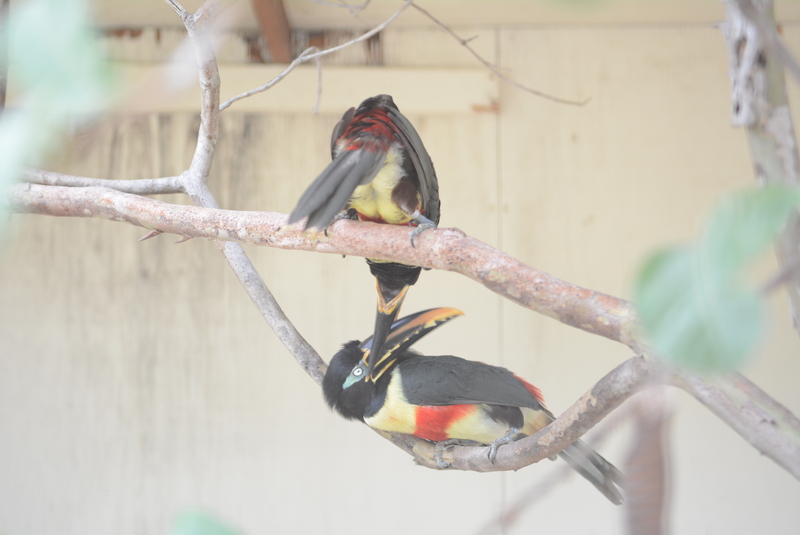 As with most monogamous birds, toucans must be compatible with their mates. When two birds are first introduced to each other, they may ignore each other, take immediately to each other, or fight like great warriors. 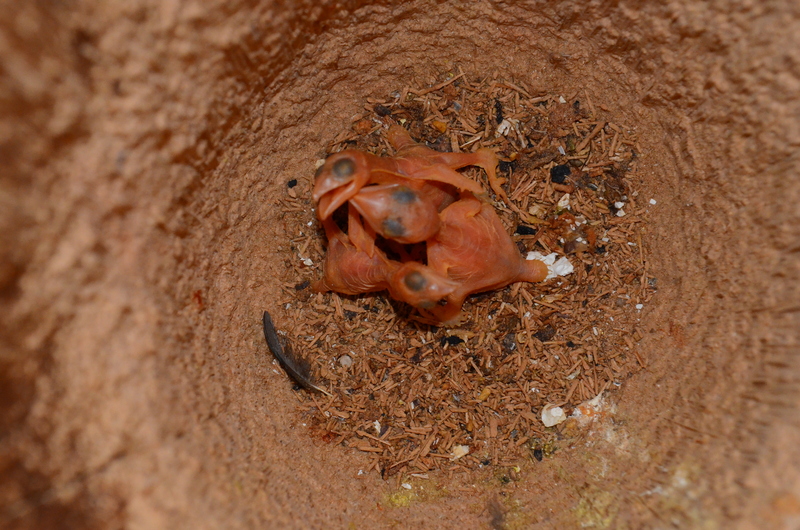 When introductions are made, they should be done in the morning and the birds should be observed frequently for several hours to make sure they do not fight. Once it is evident they will not fight, it is important that they get along, which may not be evident for days or even weeks. If they are getting along and like each other, you will notice them sitting close to each other, and when breeding season arrives you will notice that they feed each other in a fashion similar to that expressed by parrots. If the birds begin to fight, the fight may not last more than a few minutes. 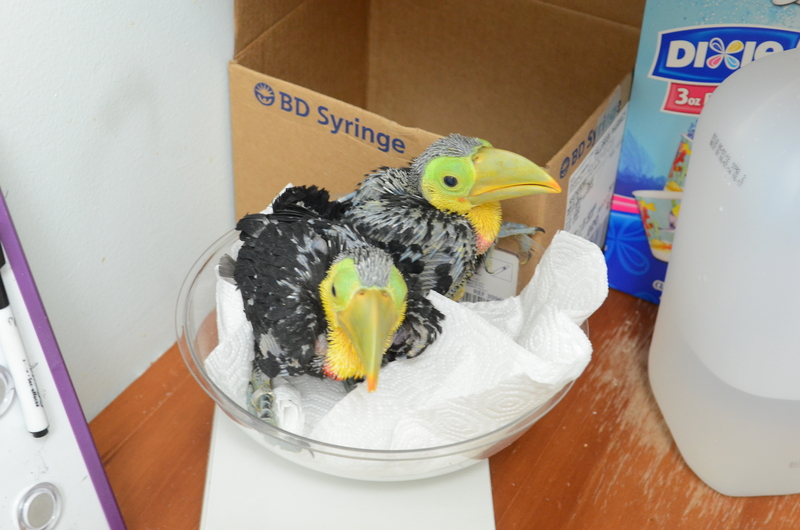 However, if they persist, the birds must be separated to avoid serious injury. In that event, they may be introduced to each other at a later date, and if unsuccessful, different mates should be selected for the aggressor and aggressee. If the birds do not fight, but avoid each other after many weeks, it is also desirable to select different mates for them. When a pair apparently gets along, is seen sitting together frequently, but does not breed, perhaps their flight is not satisfactory to them and they should be moved to different quarters. 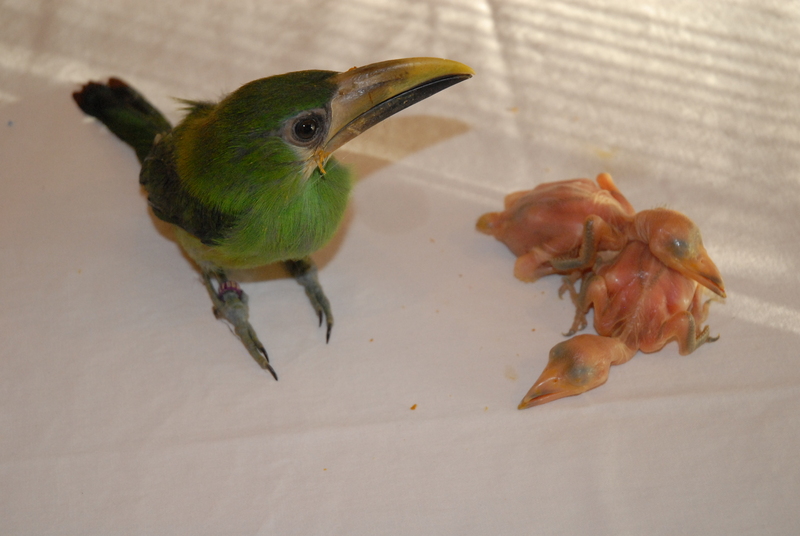 It is not surprising that diet plays an important role in the breeding of toucans. While there is no scientific knowledge suggesting the right combination of proteins, carbohydrates, fats, vitamins and minerals, it would appear that they have a relatively high protein requirement and a low fat requirement. Toucans are omnivores, but the vast bulk of their diet in the wild consists of fruit, and they are known to feed from over 163 species of plants in Manu National Biosphere Reserve in southeastern Peru.The remaining portion of their natural diet consists of a variety of insects and some small vertebrates or eggs, which are taken primarily in the breeding season when the protein demands of their offspring are quite high. In captivity, fruit is a must and the greater the variety, the better. 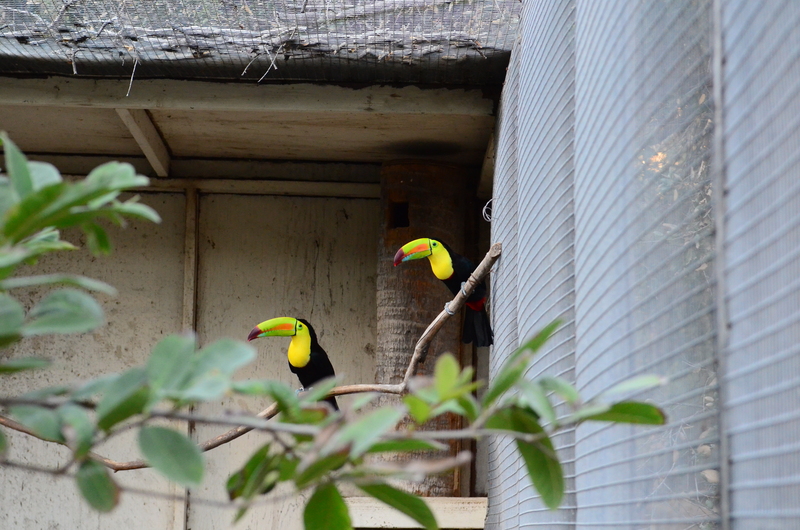 At Emerald Forest the toucans are fed papaya, grapes, and blue berries. The only fruits that must be avoided are those high in citric acid. It must be noted that citric acid and ascorbic acid (Vitamin C) are not the same thing. These acidic fruits are what we commonly think of as citrus, but also includes such items as pineapple, and tomatoes. A balanced diet, we must resort to commercially available pellets, which provide the protein and fat requirements of toucans. An extremely important aspect of any pelleted diet is the iron content, which should be less than 100 parts per million (ppm). The only pelleted diet on the market today meeting that requirement is the Mazuri Low Iron Softbill Diet, manufactured by Purina Mills. 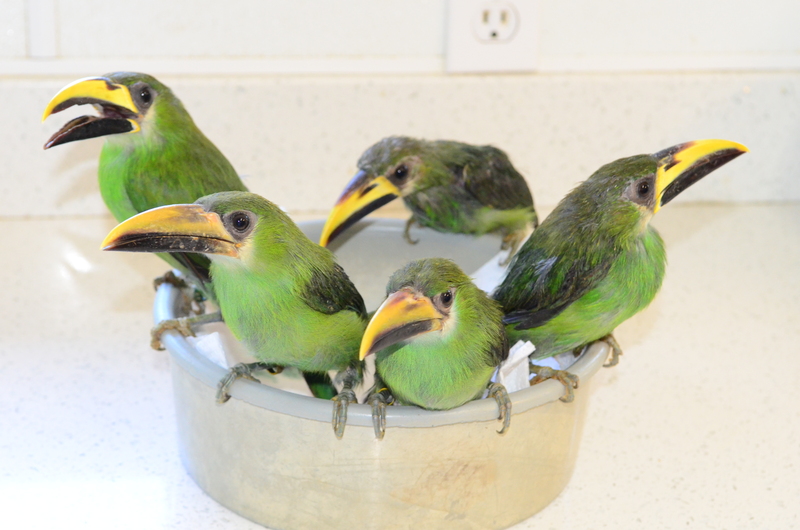 This diet has been extensively tested in feeding trials at Emerald Forest Bird Gardens, wherein liver biopsies were performed on two different groups of toucans at seven-month intervals. The Mazuri diet was compared to other diets and found to virtually eliminate the problem of hemochromatosis. 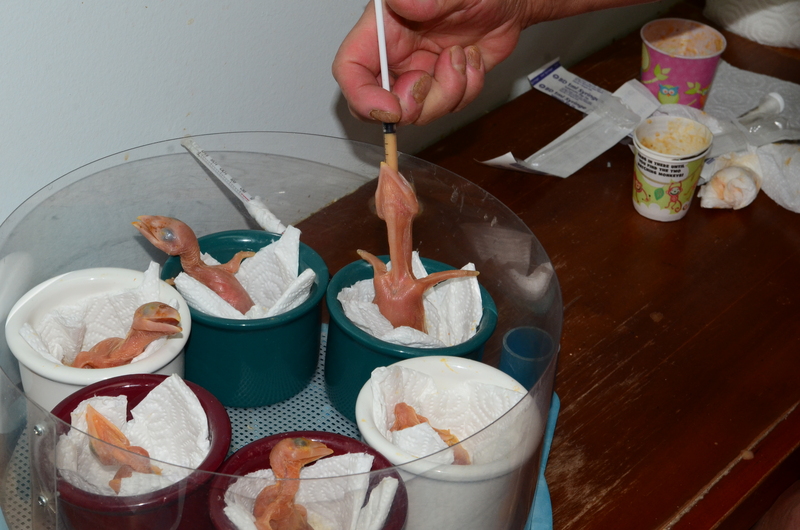 If these protocols are followed, the successful reproduction of Ramphastids should ensue. 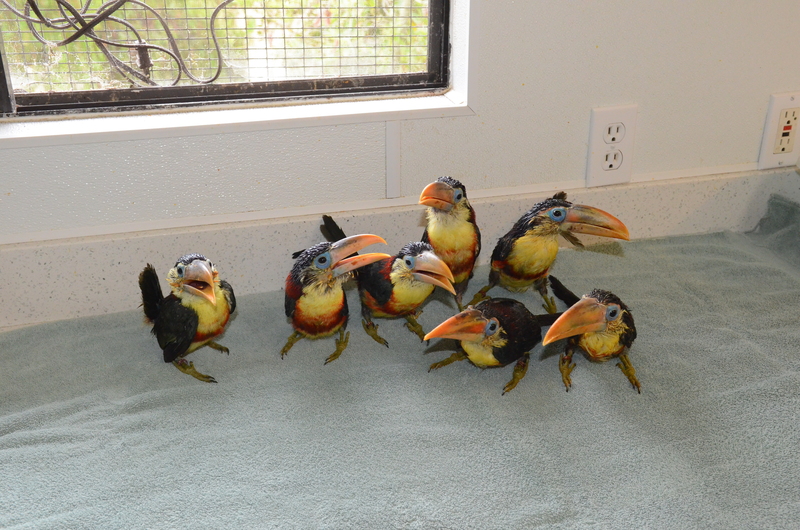 We hope you will enjoy toucans as much as we do. To read the publication click below.